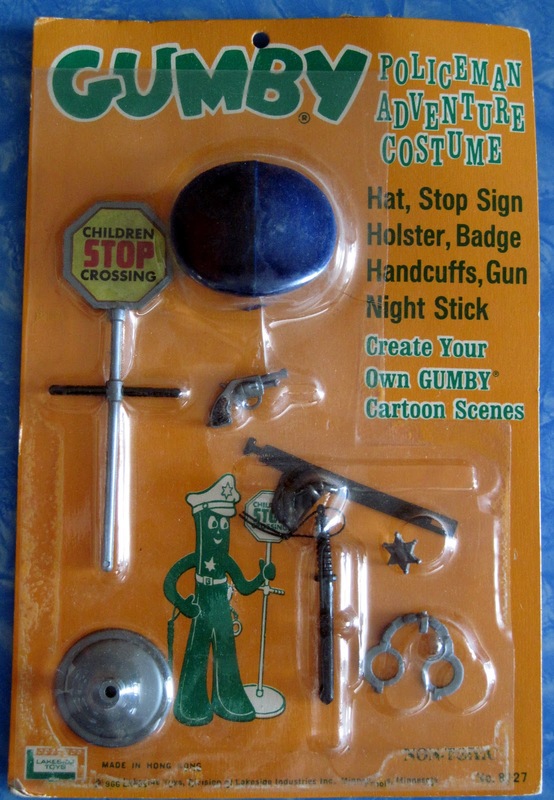 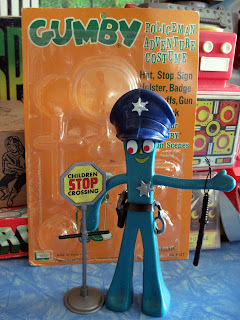 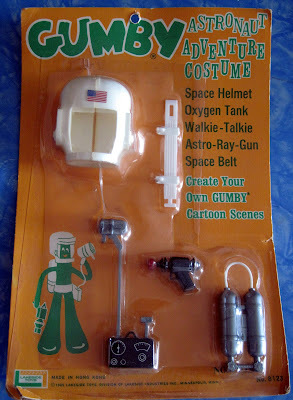 I loved Gumby as a child in the 1970s, and can still remember going to the toy store with my mother to buy a "replacement Gumby" when mine would invariably wear out. 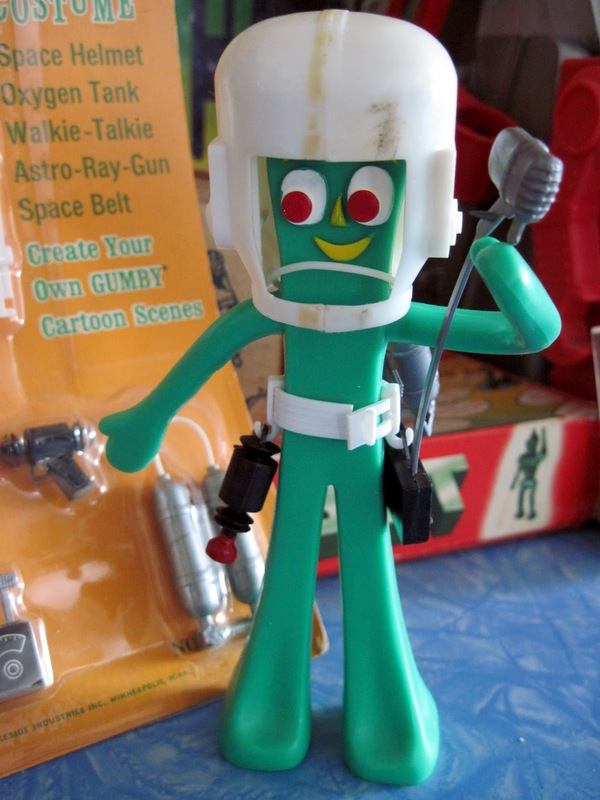 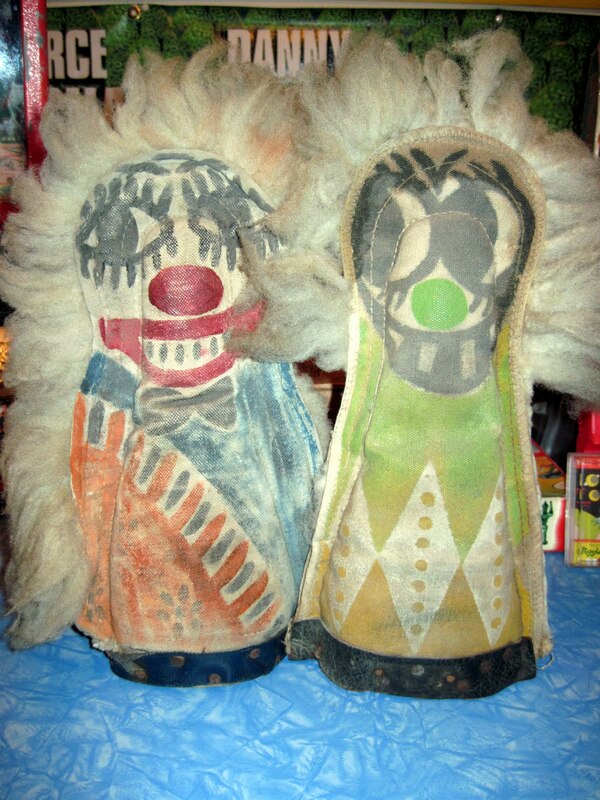 The bendable 6 inch character was created in the 1950s by Art Clokey, and had his own television show, toy figure, and board game. In 1965, a series of costumes were released for Gumby, which allowed him to take on various exciting personas: knight, astronaut, cowboy, etc. 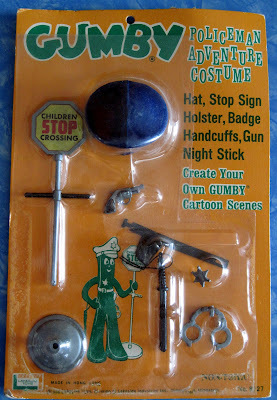 Recently I found a few, and my latest Gumby has been trying them out. 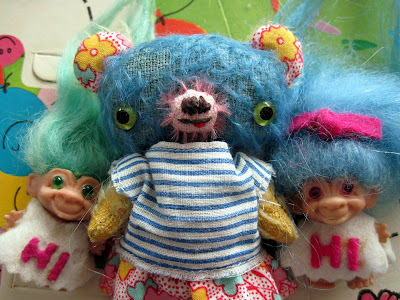 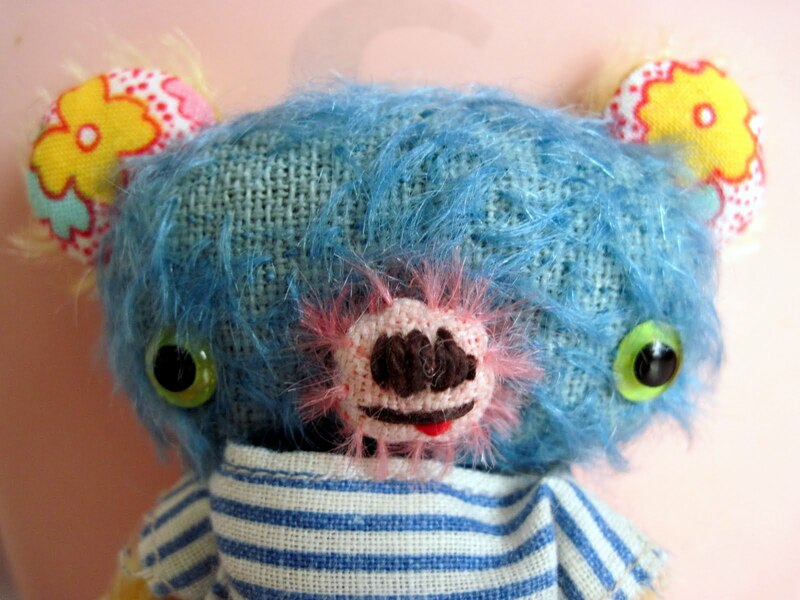 It's always a happy day when a new bear by Peng Peng, one of my fave artists, arrives. Please meet "Saltine," a mere 3 3/4 inches of crazy joy. 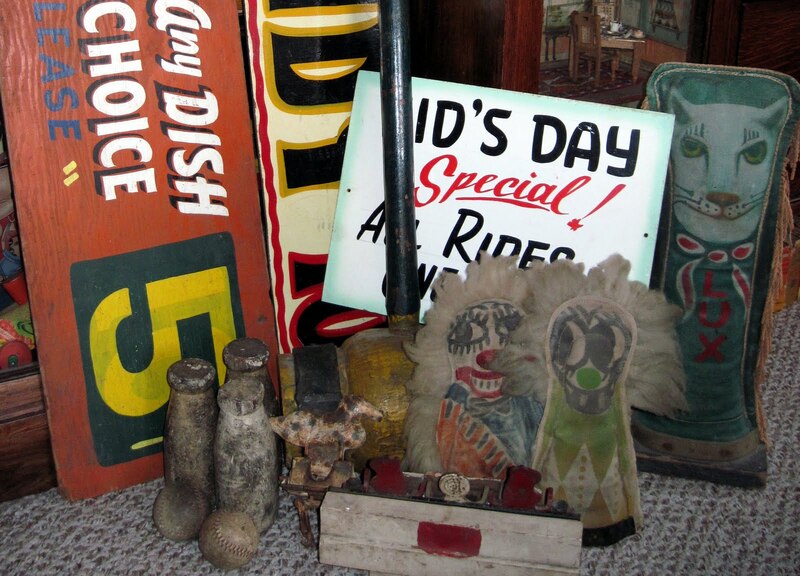 Antique dollhouse grocery shops are some of my favorite things to collect. 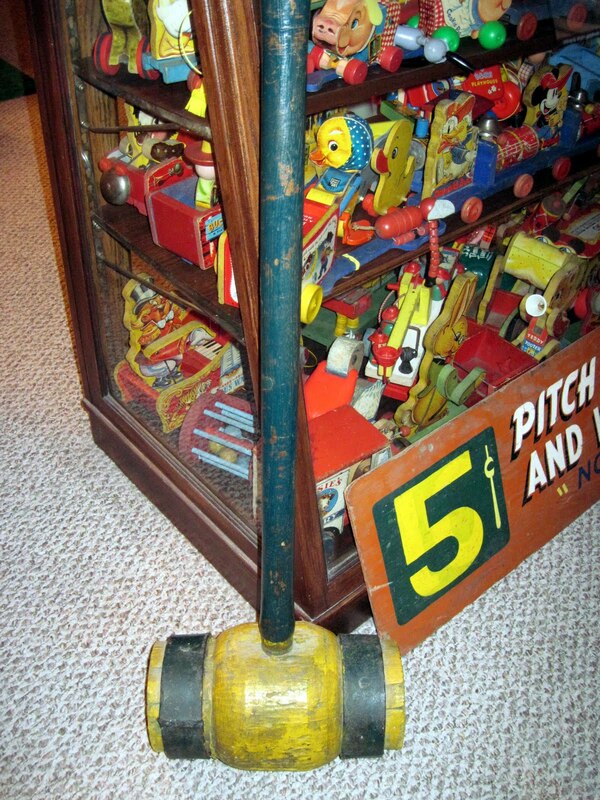 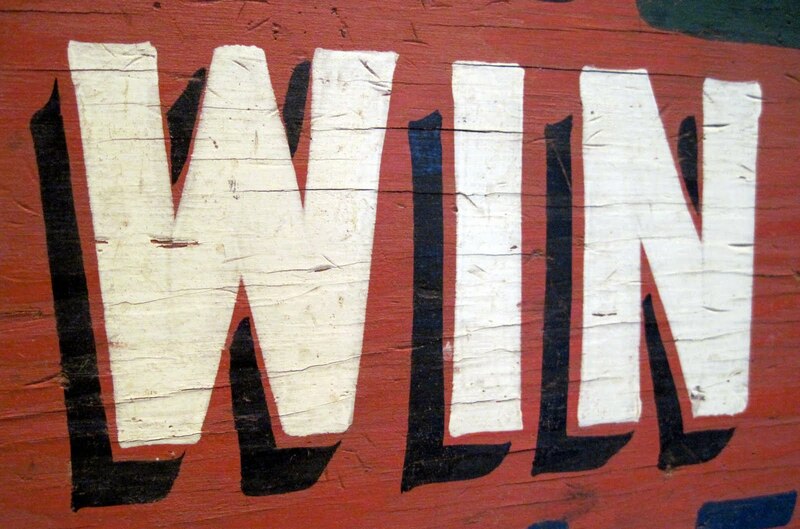 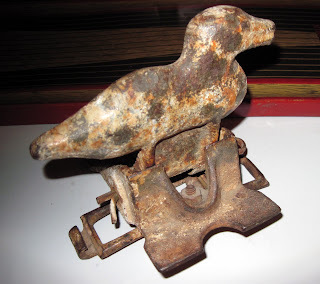 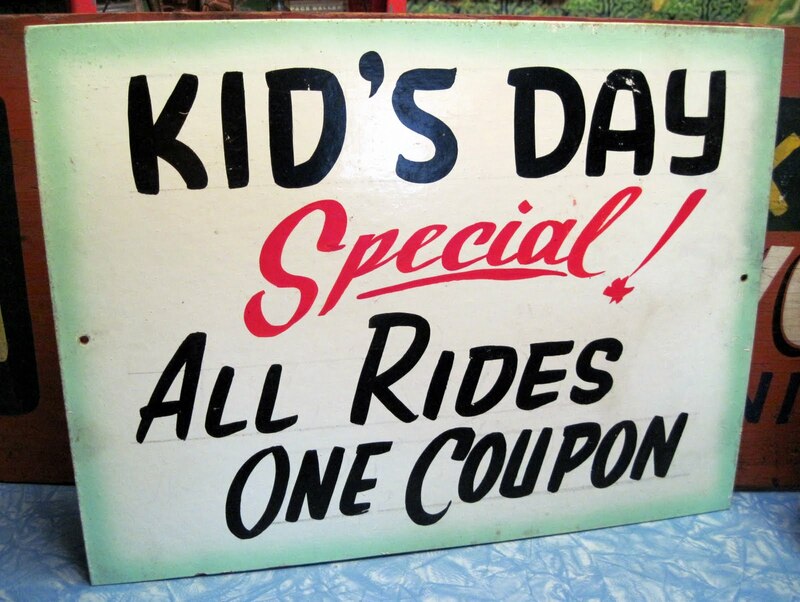 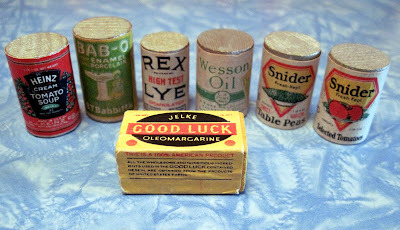 Most were made in Germany, from the mid 1800s all the way through the 1960s. 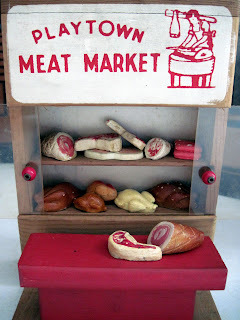 Here are a few accessory pieces I found recently to restock my shelves. 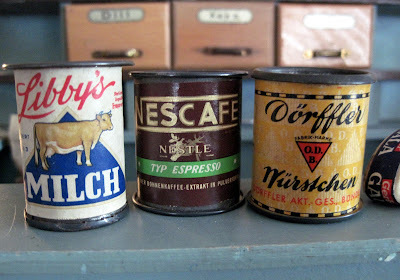 Miniature canned goods (milk, coffee, and sausages): tin cans with paper labels, made in Germany circa the 1930s, 1 1/2 inches tall. 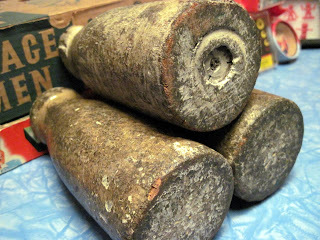 Tiny cheeses: cardboard, composition, and glass. 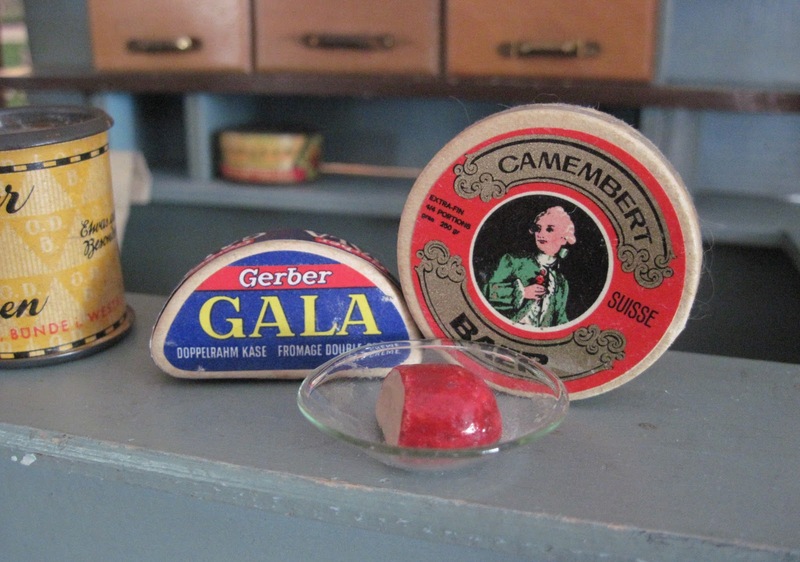 Dish is 1 1/4 inches in diameter, circa 1930s. 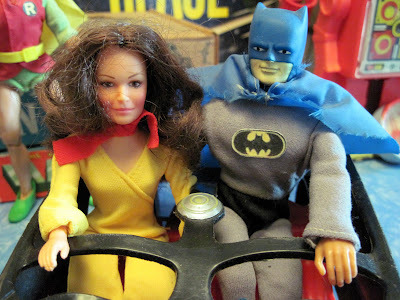 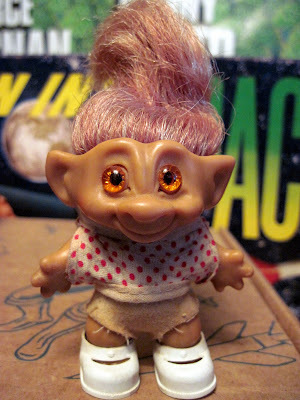 When I got her home, a happy discovery was made: she's just about the same scale as my vintage Mego Batman doll! 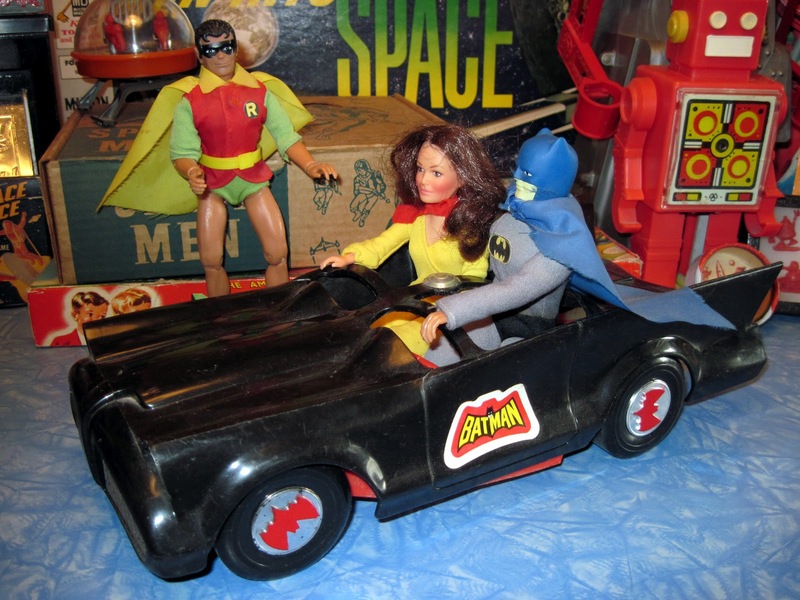 Batman was clearly happy about it, too: he's callously tossed Robin aside for Kelly. Poor Robin...I hope those menacing robots don't get him. 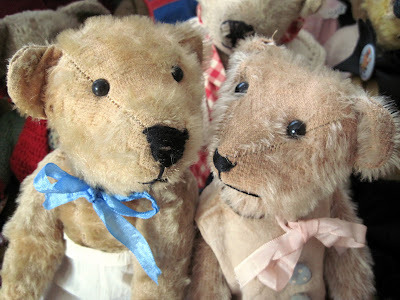 He may be okay, though, as they appear to be looking the other way. 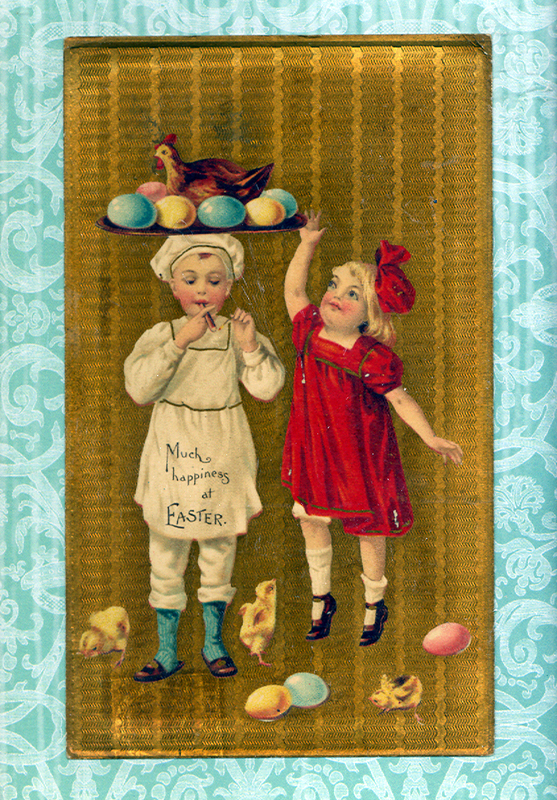 This very strange German made Easter postcard from the 1900s features all the holiday sights one would expect (chicks, colored eggs), but also a little boy chef who is smoking a cigar while balancing a tray with an apparently live chicken on his head. I do not know why. Perhaps this is some little known European spring time custom, or perhaps the German Easter Bunny also brings stogies. 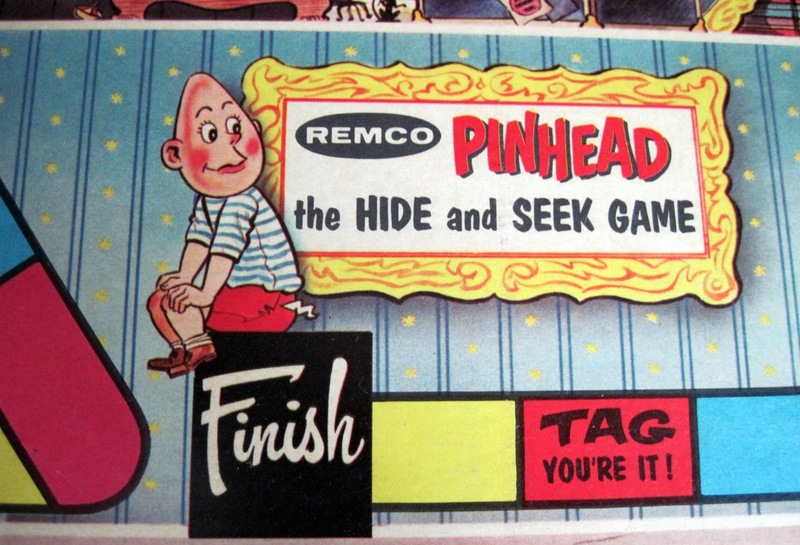 One of the oddest board games ever made must be Pinhead, released by Remco in 1959. The first inkling of strangeness comes right away, as you peruse the cover. 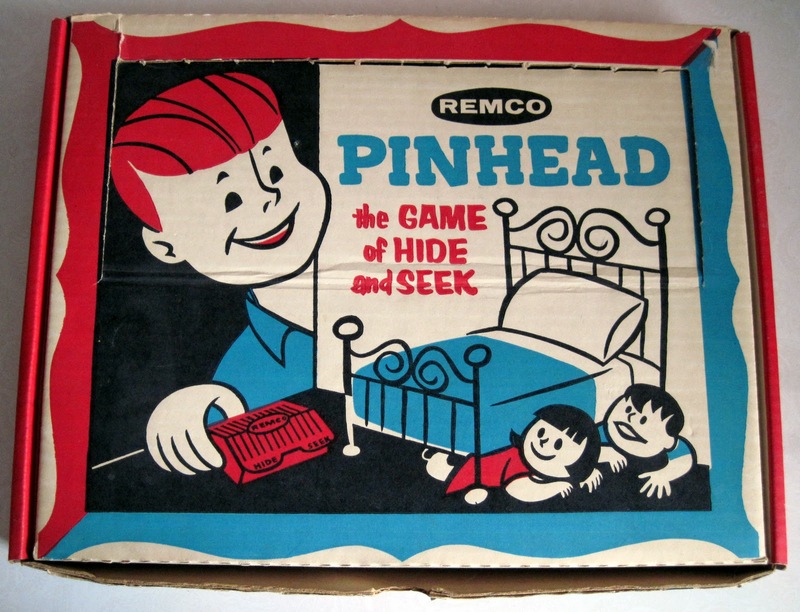 Why is a "game of hide and seek" called "Pinhead"? 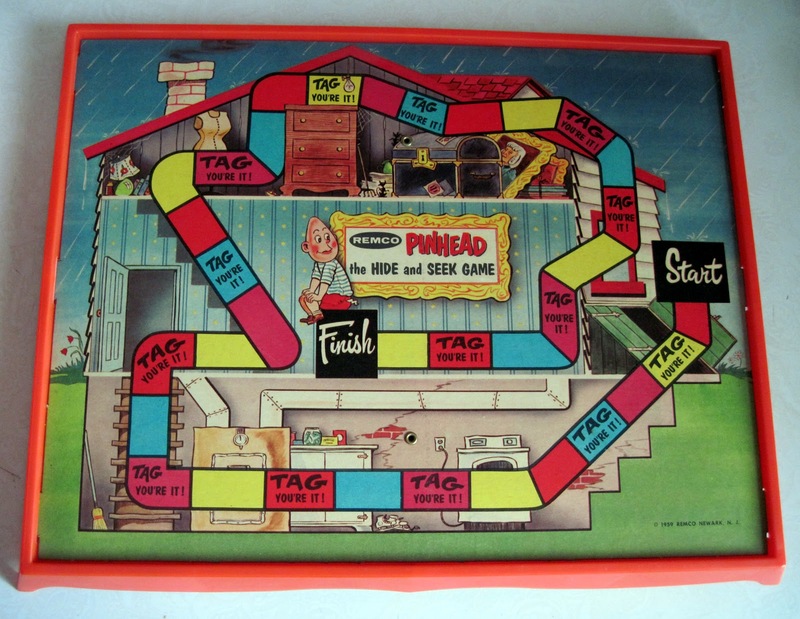 What does a deforming neurodevelopmental disorder have to do with a classic children's playtime activity? 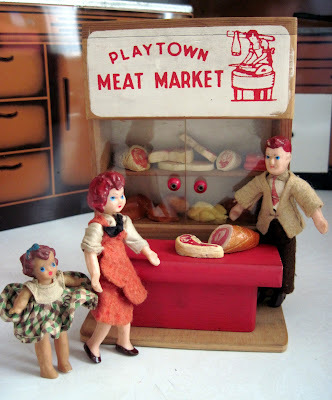 Why is the one boy so much bigger than the other children? Is it also about dwarfism and/or gigantism? 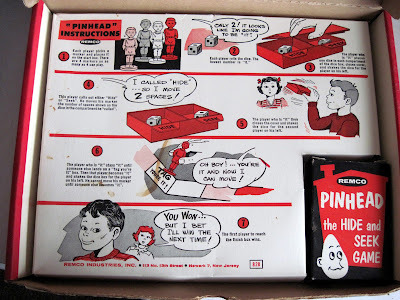 You might expect some answers to these baffling questions once you open the box, but no: the oddness just intensifies. 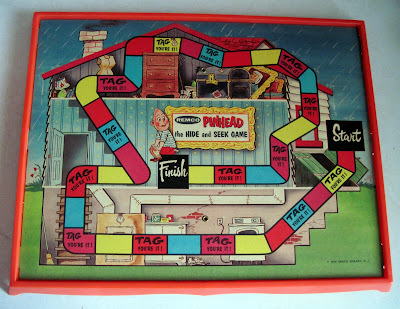 There is, in fact, a pinhead on the house shaped game board, and he is "hiding" out in the open, in the middle of what appears to be a hallway. So...not hiding, then. I mean, wouldn't it have been more like hiding if he was tucked away in the attic clutter, or stuck behind one of the basement appliances?? Remco games were notable for: 1. being strange, and 2. having unusual methods of rolling the dice. 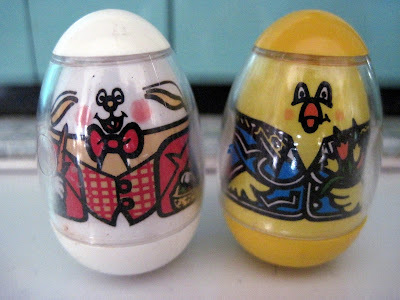 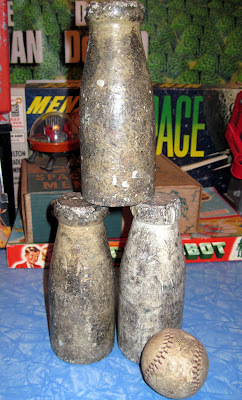 Remco's "Tumblebum Dice Games" included an hourglass shaped device with dice inside. 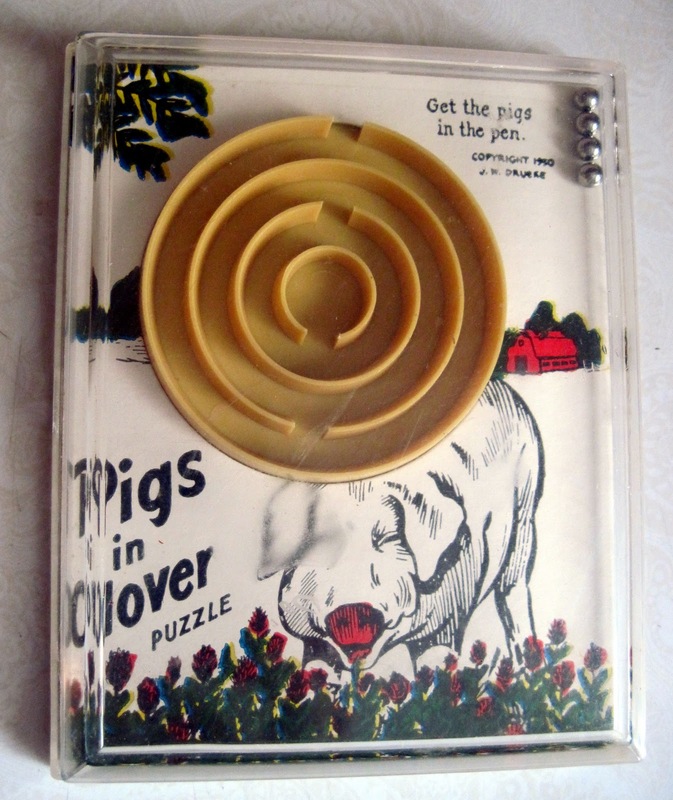 Tipping the device over essentially rolled the dice. 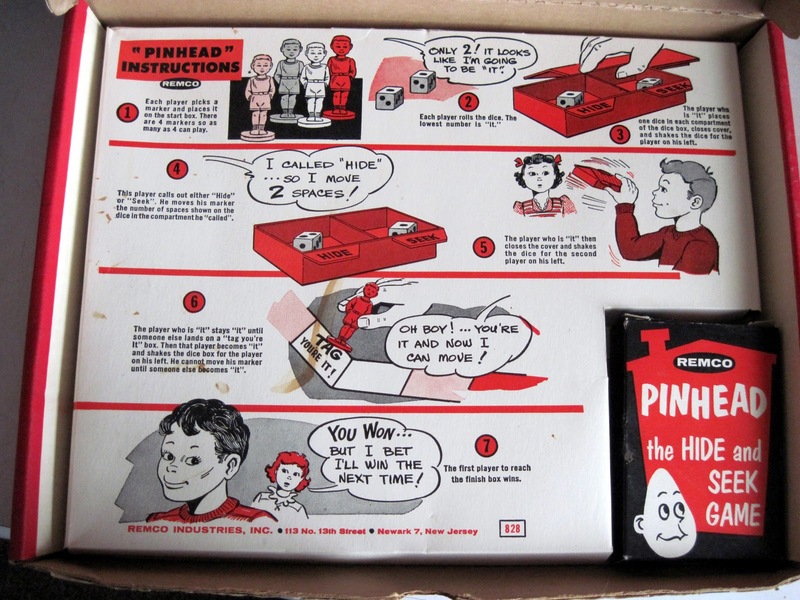 Pinhead features a different mechanism: a dice box, in which the dice are shaken while the lid is closed. 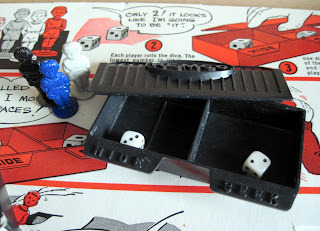 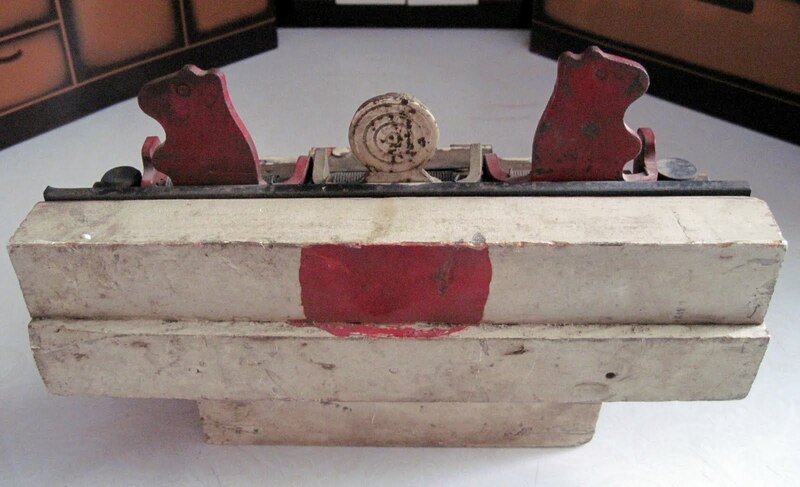 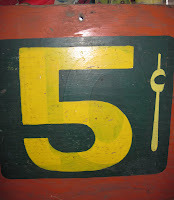 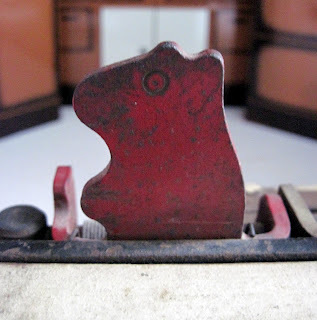 These elaborate dice rolling devices seem to have been Remco's attempt to enliven games that were otherwise rather simple, straightforward "tracks", wherein players simply moved their markers along a course. 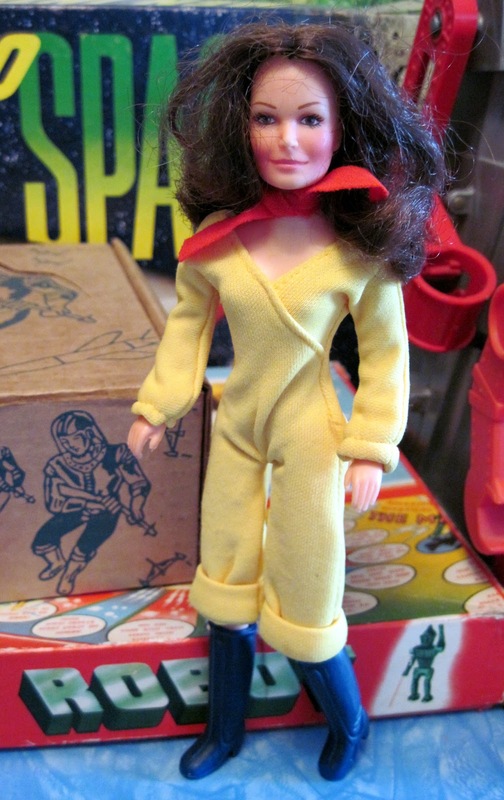 Remco games are relatively scarce, and strange though they may be, are worth snapping up when found. 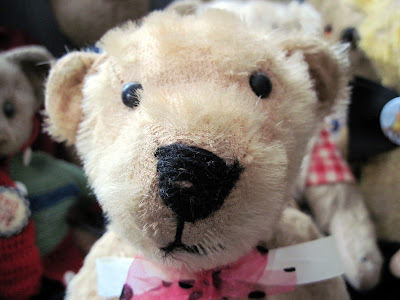 Possibly the cutest antique teddy bear ever. 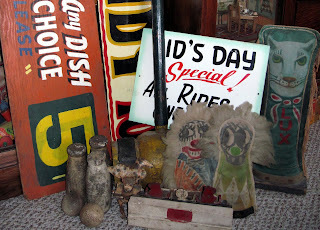 Some antique dollhouse "tobacco felt" rugs. 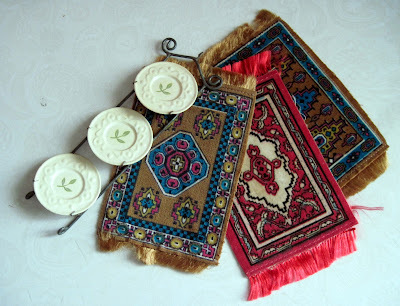 These 5 inch rugs were given away as premiums with cigarettes and cigars in the early 1900s. 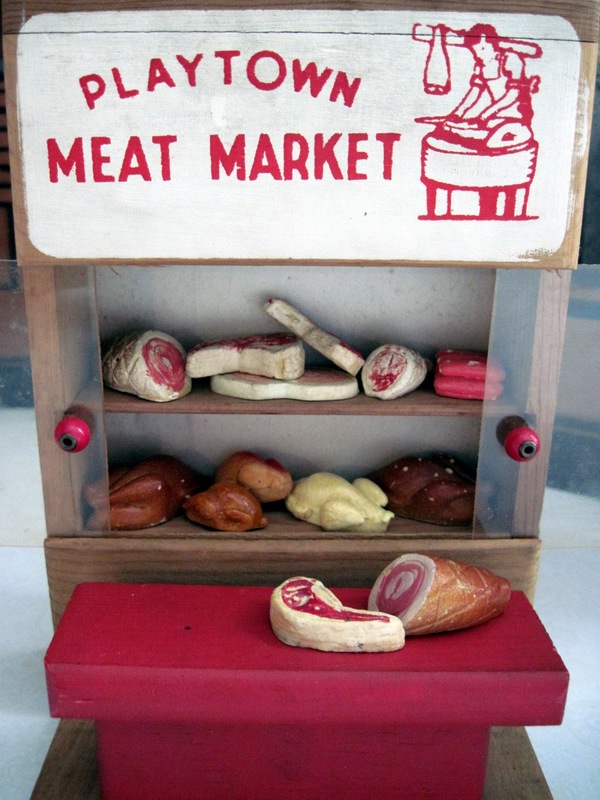 In the same booth, I also got a nice old dollhouse plate rack, complete with its plates. 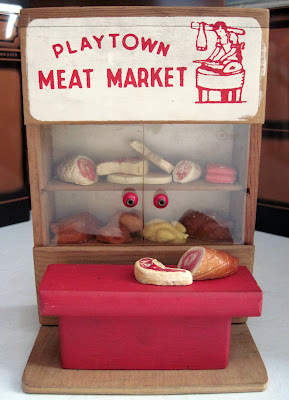 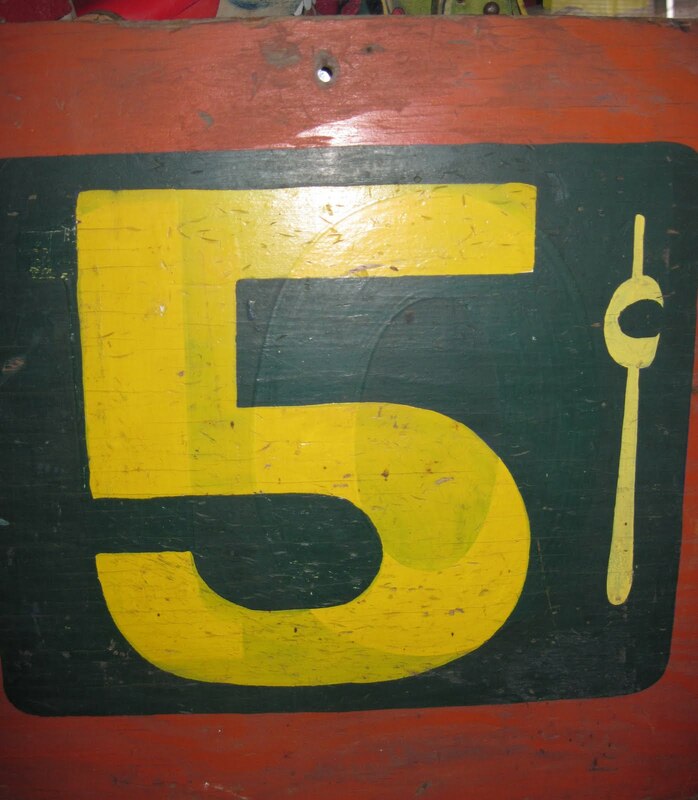 Next, I got a bunch of dollhouse grocery items, all made of wood with paper labels. 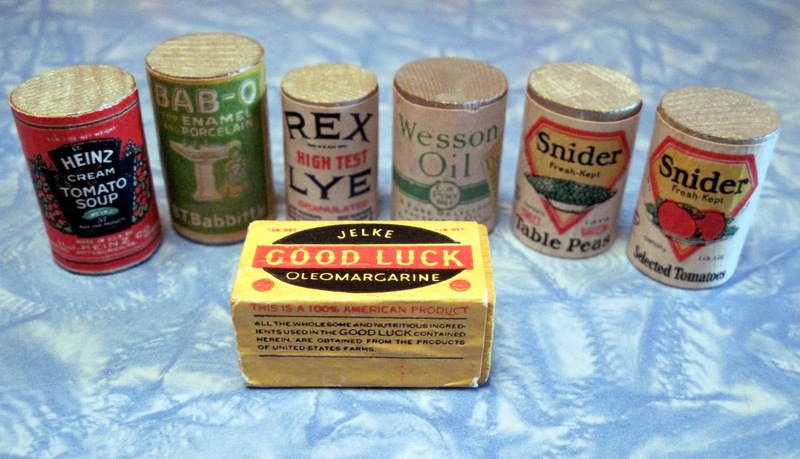 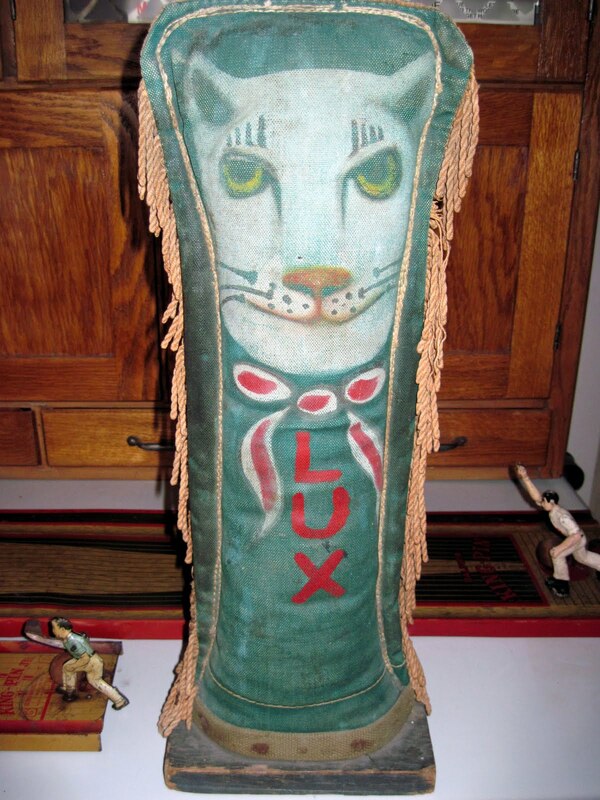 The largest can is 1 1/4 inches tall, and they all date from the 1920s-30s.